Ready in just 20 minutes, this easy pasta is going to become your new go-to dinner for busy weeknights. 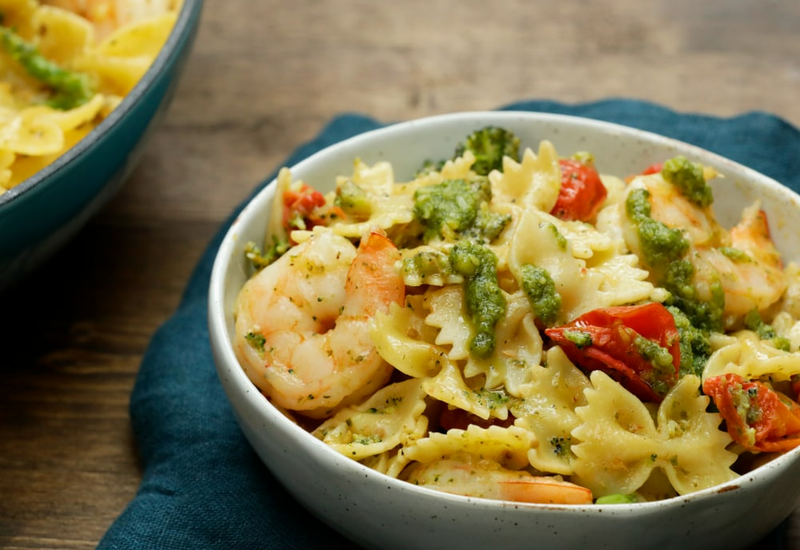 The farfalle, broccoli and shrimp are all cooked in the same pot, making for super easy cleanup. The seasoned cooking water gets absorbed into the pasta and vegetables, infusing each ingredient with flavor and moisture. The pasta, shrimp and vegetables are tossed together with a little olive oil, prepared pesto and creamy mozzarella cheese. Sliced cherry tomatoes add a pop of color and acidity, as well as adding heart-healthy nutrients to the dish. Buon appetito! Cooking the shrimp, pasta and broccoli together in one pot means that the flavors will meld together and be well-seasoned. Vegetarian? Omit the shrimp, and double the amount of broccoli and/or cherry tomatoes. You could also try cubed chicken pieces instead of shrimp—simply add with the broccoli and cook until no longer pink in the center. Per Serving: 599 calories; 27g fat; 48.4g carbohydrates; 41g protein; 255mg cholesterol; 2370mg sodium. so easy and delish. the water boils right off when you leave the lid off, such a cool hack to making a one pot pasta! I'm a huge fan of pesto, so I'm a little biased. However, what makes this recipe great is that it's well rounded with shrimp, broccoli, and tomatoes all in one pot. I also really like the garlicky flavor, which isn't too overwhelming in this dish. It's so easy to make, it will definitely be a part of my weekly rotation. There are so many ways to use pesto and this is one really good example. I made this recipe on a Monday night and it took less than 30 minutes, incredible! Next time I will probably use angel hair pasta, just because I prefer that one over farfalle, but overall, delicious! I've made this recipe a bunch of times, but never with shrimp! Always with chicken, which can get old and boring fast. The only thing I changed is I didn't add any mozzarella cheese. It was fine without it. This dish cooks very quickly, which is awesome. I made this but with zoodles for a lighter, low carb alternative. I also found a basil pesto recipe on this site, which paired perfectly with this dish.